Similar to Korean Mint but with a strong smell of aniseed. Anise Hyssop plant, Agastache foeniculum, is also known as:Liquorice Mint. The leaf is used as a tea, in salads, soups, fruit dishes and as a base for fruit cup. A companion plant which attracts bees to the garden. Used in pot pourri. Traditional use by Native Americans as a remedy for coughs and respiratory problems. Anise Hyssop plant is native to central North America and prefers well drained soils in an open sunny position. Compact growth habit. Frost and drought resistant. Herbaceous perennial (above ground parts die back in autumn), growing to 1m x 0.6m. 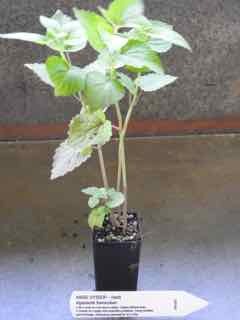 Be the first to review “Anise Hyssop, plant” Click here to cancel reply.